The Wright brothers, Orville Wright (August 19, 1871 – January 30, 1948) and Wilbur Wright (April 16, 1867 – May 30, 1912), designed, built, and flew the first controlled, powered, heavier-than-air airplane on December 17, 1903. They had been experimenting for many years with gliders and other vehicles before their first powered flight. They are also known for making the first way to steer an airplane. They designed the aircraft in Dayton, Ohio, and their first test flight was in Kitty Hawk Heights, North Carolina. The Wrights both grew up in Dayton, Ohio. They were sons of a minister. There were a lot of books in their house, and they were encouraged to ask questions and find out about whatever they thought was interesting. Sometimes their father would ask them to argue for a topic, then switch sides and argue for the opposite point of view. They went to high school, but did not go to college; they started a newspaper instead. After that, they started a shop to build and repair bicycles. By the 1890s, the Wrights were interested in flight, especially the gliders of Otto Lilienthal. They started working on making airplanes in their bicycle shop. They thought controlling a plane was one of the big problems of flight. Lilienthal and others had been killed when they could not control their aircraft. The Wright brothers fixed the problem by building wings that could be twisted a little and moved up and down slightly. From 1900 to 1902, they built gliders in Dayton and tested them in Kitty Hawk, where there were strong and steady winds. During these years, they also made small versions of the wings, and built a wind tunnel to test how well different wing shapes would lift an airplane. In 1903, they built a powered airplane that had a propeller and a light but powerful engine. 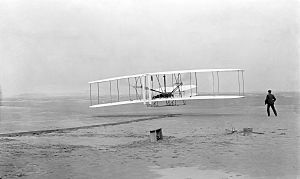 The Wright Flyer airplane first flew successfully on December 17, 1903, in Kitty Hawk, North Carolina. This was the first time people ever flew a powered airplane they could control. Before that, people flew in balloons or gliders, or for a very short time in planes they could not control. The two brothers continued to make changes to their design, and had a very good plane by 1905. Picture of the first flight with Orville Wright at the controls and Wilbur Wright running beside it. After that, they started a company to build airplanes and had a “patent war” with Glenn Curtiss over who could make money from the invention of the airplane. 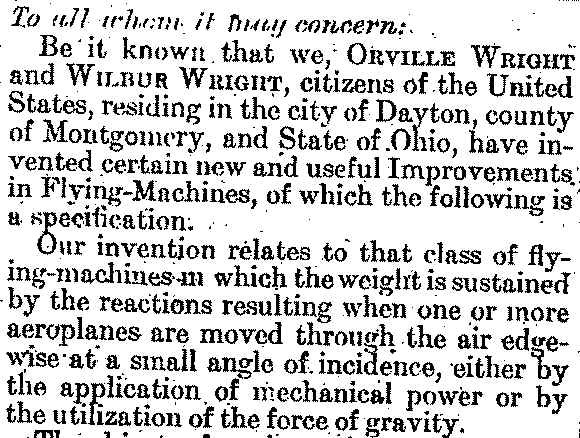 During the patent war, Wilbur died. Orville continued working to keep his reputation as the first man to fly. Later he sold the airplane company, and became an “elder statesman” of aviation. He died in 1948. Chanute's hang glider of 1896. The pilot may be Augustus Herring. 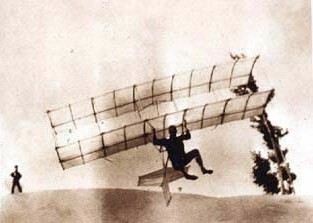 The 1900 glider. No photo was taken with a pilot aboard. Orville with the 1901 glider, its nose pointed skyward; it had no tail. Wilbur just after landing the 1901 glider. Glider skid marks are visible behind it, and marks from a previous landing are seen in front; Kill Devil Hills, North Carolina. Wilbur Wright pilots the 1902 glider over the Kill Devil Hills, October 10, 1902. 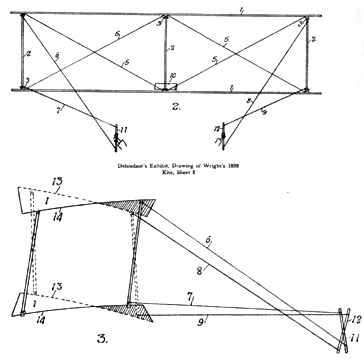 The single rear rudder is steerable; it replaced the original fixed double rudder. Wilbur makes a turn using wing-warping and the movable rudder, October 24, 1902. 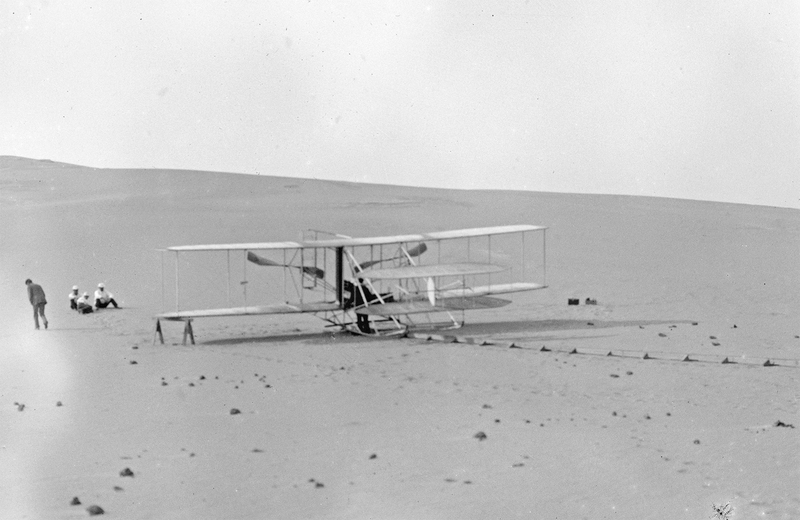 The modified 1905 Flyer at the Kill Devil Hills in 1908, ready for practice flights. Note there is no catapult derrick; all takeoffs were used with the monorail alone. 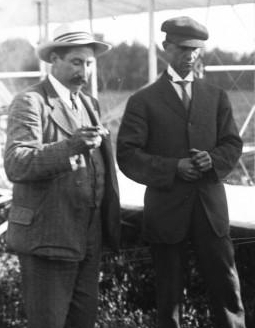 Soaring flight, Kitty Hawk, Oct., 1911 "Arrows indicate 50-Mile Wind, Showing How Machine Was Sustained in a Stationary Position"
Hart O. Berg (left), the Wrights' European business agent, and Wilbur at the flying field near Le Mans. Elwood Doherty, a Curtiss pilot, coaxes the structurally modified Langley Aerodrome into the air above the surface of Keuka Lake near Hammondsport, New York, September 17, 1914. Original 1903 Wright Flyer in the National Air and Space Museum in Washington, D.C. 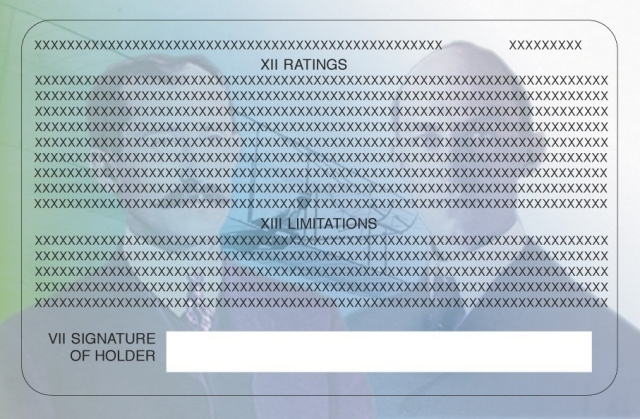 The back of the US Airman Certificate with a picture of the Wright brothers. Wright brothers Facts for Kids. Kiddle Encyclopedia.